H:\ Drive is a storage area specific to your Student Desktop. 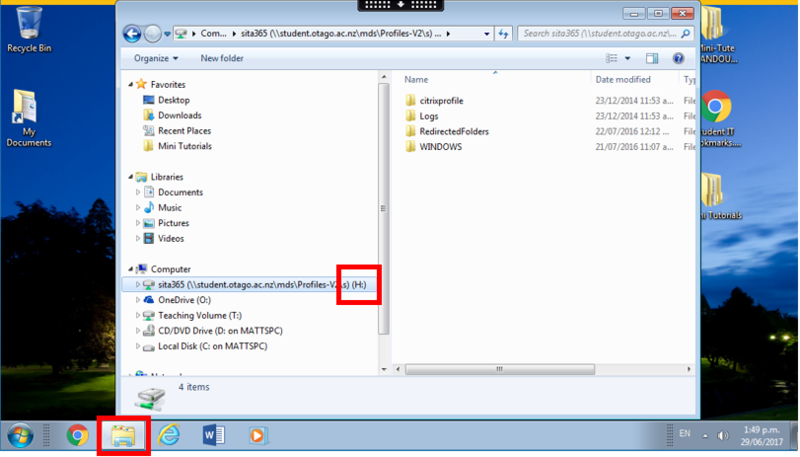 This means that no matter where you log in to your Student Desktop, the files will always be the same. This is handy if you like to work on more than one machine. Fast to access, so good to use for documents you are currently working on. Once you are in your H:\ Drive you might notice a number of folders that were not created by you. Do not delete these folders. These are required by the system. However, feel free to create as many new folders as you wish. The better you organise your file system, the easier finding things will be. OneDrive is 1TB (terabyte) of online storage that comes with your University enrolment. OneDrive is accessible at any time through the internet, and also through the Student Desktop. This storage space is much larger than your H:\ Drive, but slower to access, so it is good for storing files that you don't need to access regularly. OneDrive is hosted externally in the cloud. This means you can access your OneDrive anywhere you have access to the internet. Below are the main ways to get to your OneDrive.